A little over a year ago a fire destroyed our storage unit and all its contents. 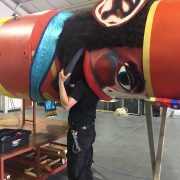 Ten years of our work along with our replica of Pullen’s Giant puppet went up in flames. But like the Pheonix we’ve risen from the ashes to rebuild yet another magnificent puppet and continue the journey. Following a creative development week in June 2018, Pullen’s Giant III hit the road for Surrey where he spent a long summer. He’s been happily ensconced at the beautiful Watts Gallery – Artists’ Village for the ‘James Henry Pullen: Inmate – Inventor – Genius’ exhibition, where Pullen’s Giant came to life on 27th October as part of their Museums at Night programme. 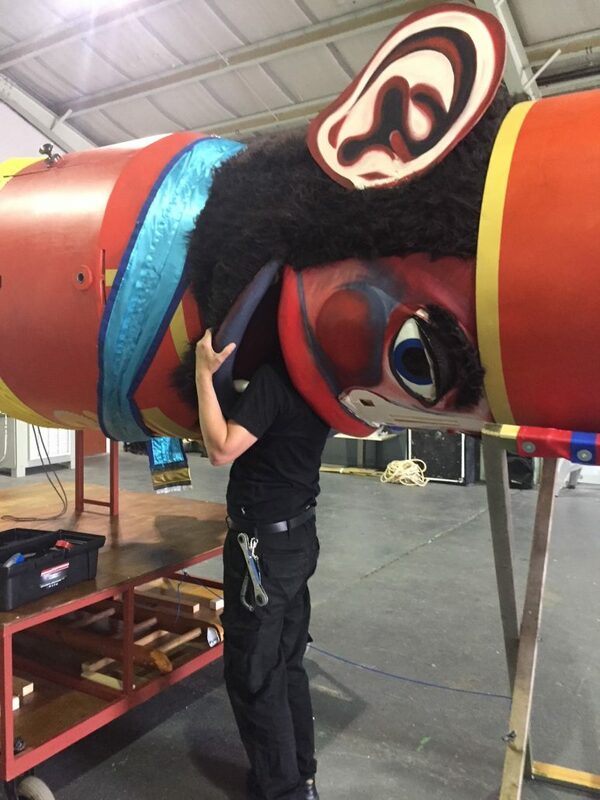 Audiences were thrilled and over 150 people of all ages were delighted to get up close and personal with our extraordinary giant puppet! Thank you to Vital Xposure and Julie McNamara for animating Pullen’s Giant for us today as part of #MuseumsAtNight. We are open tonight until 8pm – #WattsLate – #Imaginarium.  The story of James Henry Pullen has stirred Vital Xposure’s hearts and minds. Pullen was a brilliantly skilled creative artist who spent close to 70 years at the Earlswood Asylum, positioned as an ‘idiot’ in an era when society did not accept people with learning disabilities. By building the replica of Pullen’s Giant, we paid homage to James Henry Pullen and attempted to give him a voice, marching across Stratford’s Olympic Park to the joyous screams for Freedom and Equality for all! 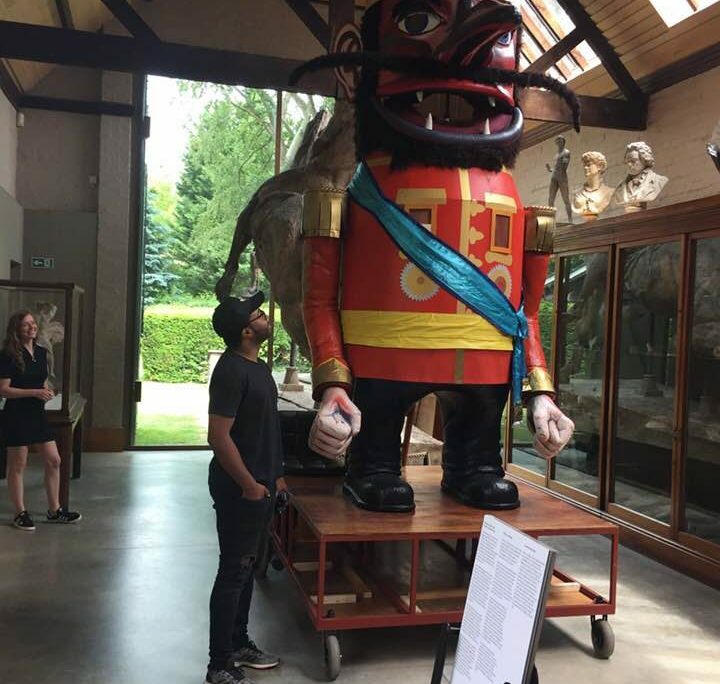 Pullen’s Giant at Watts Gallery – Artists’ Village, June – October 2018. Photo of a man looking at the giant puppet, which is twice as tall, standing proudly in the middle of the gallery room. “Of all the extraordinary objects I came across in the museum collections I investigated, I fell in love with Pullen’s Giant. He’s quite magnificent, ready for battle on behalf of Queen Victoria or taking on the asylum authorities of his day. I’d suggest he was ready for both. Never mind his splendid moustache, his uniform with Fez and sash, he is something else, with his marching arms in full swing, his flapping ears, his fully moving eyelids and a head that can swivel 360 degrees. The poem offers us the only self-penned evidence of Pullen’s inner world and reveals quite a different person to the one represented in his medical records and archives collected from Earlswood Asylum. Pullen was already creating intricate carvings in ivory when he entered asylum life. He was in the habit of selling his wares at the local taverns, where it seems he plied quite a trade. He might not have been a great scholar, but here was a man with huge imagination that far surpassed his tutors in the asylum. We can only surmise what life was like inside Earlswood Asylum, with its strict protocols containing and controlling its 400 inhabitants. We do know that Pullen was allowed small freedoms in exchange for his extraordinary carvings. As an adult he was permitted to take his meals with the staff and was escorted on several occasions to a local tavern where ‘he became enamoured of a woman from the local town’ who worked as a barmaid. It is recorded that he requested permission to marry her. Any lunatics, idiots or feeble-minded people coming under the Idiocy and Mental Deficiency legislation of the time were prevented from marrying; so Pullen was of course refused permission. The staff procured an Admiral’s uniform to mollify Pullen, who was informed that Queen Victoria had intervened and requested his services at the head of her fleet, but that Admirals were not allowed to marry. He was offered the uniform if ‘he should forget his request to marry’. He wore the uniform almost daily for the remaining years of his life. There are no records of what became of the woman concerned. ‘Maybe it was too much to get married?’ said Adam. ‘Yeah, because she’s used to running the bar. She might be expensive’, said Eden. ‘What if he had shiny buttons on his uniform and married the barmaid and then they ran off anyway?’ Eden thought. ‘What if she was just his friend and she wanted him to escape?’ Emma suggested. ‘What if he just breaks free and leads all the people outside, through the gates of the asylum?’ said Adam. We would like to thank Emergency Exit Arts associate Tony Mason for building both of our beloved puppets in 2017 and 2018 and Without Walls for their financial and creative support. There is more to read and watch about the first time our adored Pullen was liberated in 2017. Simply click here.